High-frequency trading (HFT) has seen a surge in activity amid heightened market volatility with HFT traders eyeing quick profitable trades on short price movements. 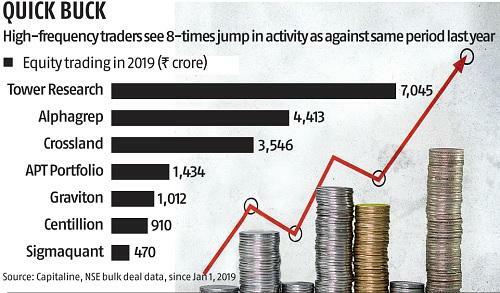 Since January, more than Rs 18,000 crore of such trades got executed in the cash market, shows NSE bulk deal data. This is eight times the turnover generated by HFT firms in the same period last year. Data analysis took into account the trades executed by seven firms, known for running HFT strategies. These included Alphagrep Securities, APT Portfolio, Tower Research, Crossland Trading, Sigmaquant (Acceletrade Technologies), Centillion Research and Graviton Research. “Volatile movement in stock prices give higher scalping opportunities to technologically-savvy traders. That is why volatile scrips tend to see high HFT volumes,” said Manish Jalan, managing partner and chief strategist of Samsarra Capital, which runs algo-based strategies. Scalping entails executing multiple trades at small-price changes. Traders try to take advantage of both upward and downward price movements. Data also shows that most of the recent HFT trades occurred in counters such as Jet Airways, Dewan Housing Financial Services (DHFL), Just Dial, Anil Ambani group stocks and Crompton Greaves Power, which have seen high levels of volatility in the recent past. In 2019, Jet Airways has seen Rs 5,168 crore worth of HFT trades, while DHFL saw Rs 3,506 crore worth of HFT trades. “Stocks with higher implied volatility tend to see sharper price movements. 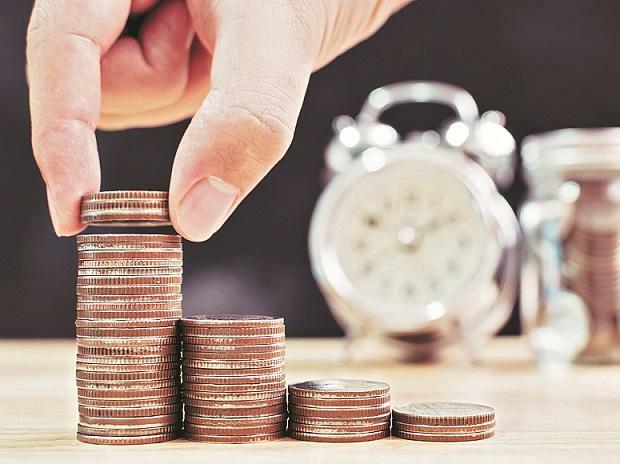 HFT strategies can capture wider price differences in such stocks,” added Chandan Taparia, technical and derivatives analyst at Motilal Oswal Financial Services. Market volatility is showing some let off amid positive start to the March-quarter earnings. However, analysts expect election-related volatility to continue. “Overall, markets are expected to do well. The positive earnings momentum in the banking sector is expected to drive markets. However, some sharp swings can be expected in the markets owing to elections,” said Pankaj Pandey, head of research, ICICI Direct. India Vix, which is considered the volatility gauge, is currently hovering around a three-year high of 21.69. To create a more level-playing field between HFT players and other participants, the Securities and Exchange Board of India (Sebi) last year asked stock exchanges to introduce ‘managed co-location services’ so that eligible vendors can offer such services to their clients. Stock exchanges were also directed to ensure that multiple vendors are permitted to provide managed co-location services at their co-location facility. The regulator has also asked exchanges to provide tick-by-tick data free of cost to all trading members, subject to creating necessary infrastructure for receiving and processing such data. Experts are of the view that the new norms introduced by Sebi could encourage more HFT participation in the market.